Norfork Lake's fishing scene is getting exciting. The lake surface water temperature has reached 60 degrees and should increase a little this week with the forecasted warm nights and daytime temperatures. As the water temperature increases the fish will increasingly become more active. 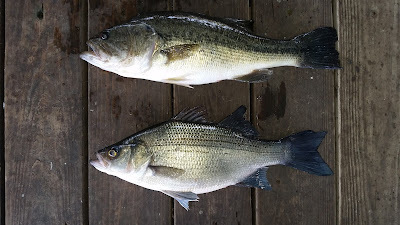 For me the best bite on the lake at this time is for largemouth and smallmouth bass. Many of the bigger fish have moved to the banks and are starting their spawn. If you are a bass fisherman it is definitely a great time to come and fish the lake. A couple of our guests over the weekend landed over 20 smallies on a centipede with approximately half of them being of keeper size. I landed some nice fish this morning using a swim bait, and jerk bait as well as live bait. 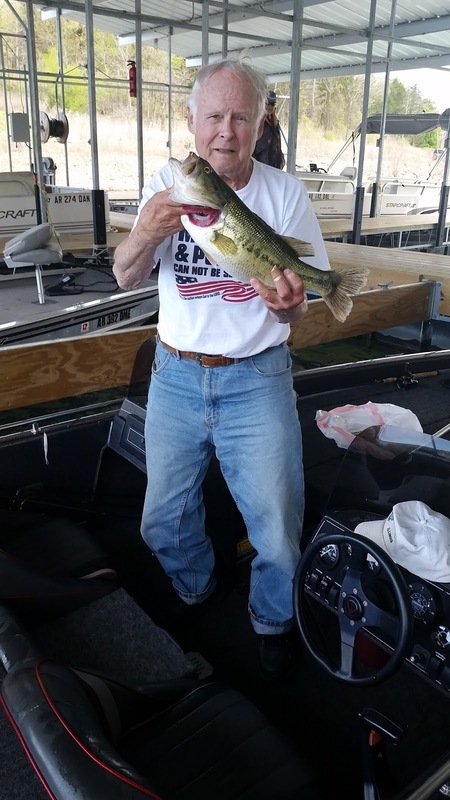 Another of our guests was fishing from our dock casting a spinner bait to the shore line and landed 5 largemouth bass, one a 4 pounder. Watch for top water action early and late in the day. They are also coming up for a Zara spook even if you don't see the fish break surface. 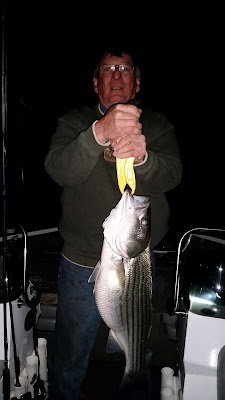 Striped bass fishing has had its ups and downs over the last several weeks. They are still scattered though out the lake. 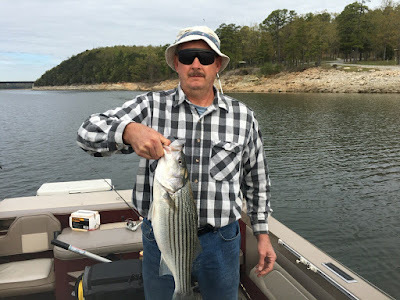 When you locate big schools of baitfish the stripers will be close by. 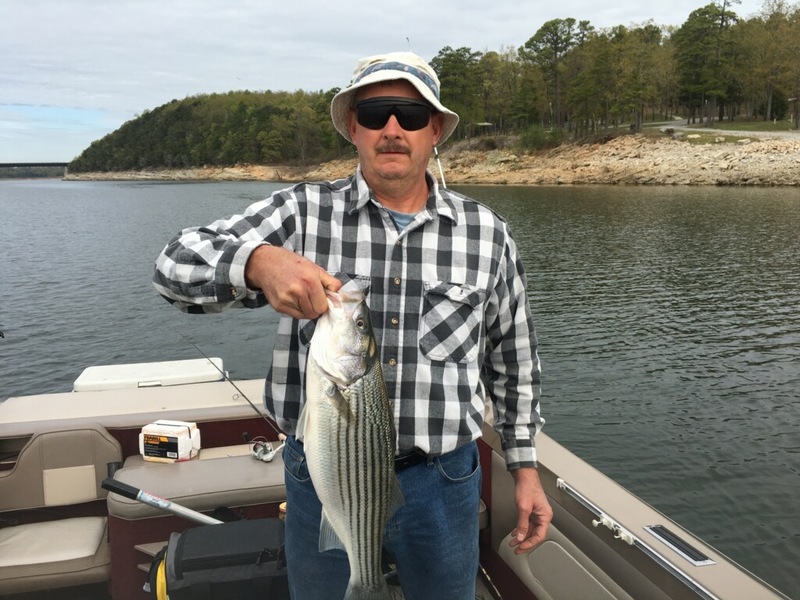 The stripers, hybrids and white bass are all in similar type areas. Look back in creeks and coves and on shallow flats. In the early mornings I have found them in shallow water, but as the sun comes up they are moving out to deeper water along with the shad. Trolling a swim bait has been picking up a few nice fish as has fishing with live bait. 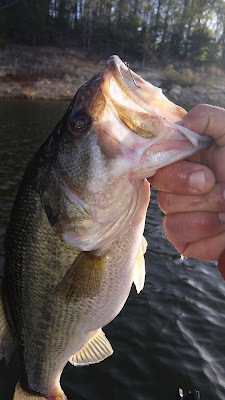 The night bite is continuing, but like the day bite, one day you can find them then the next day they have moved on and you're looking again. I have been using Kastmaster type baits as well as small spinners to catch these species. With the warming of the water, I anticipate top water action for these species to start very shortly, so keep a watchful eye out. It could happen anywhere- could be in 100 feet of water or along the shoreline. Crappie fishing is starting to heat up. The best locations for the biggest numbers of fish are back in the shallow waters of the major creeks. Find some brush close to shore and cast out a 1/16 jig and let it fall slowly. When your line tightens set the hook. I landed an almost 16 inch fish the other night while striper fishing. I was throwing a Smithwick Rogue and this fish just hammered my bait. All you could see was the head and the bill of my bait. Talk about being aggressive! Lake Norfork's current level is falling slowly and sits at 552.88 ft above sea level. The Corps is running one generator sporadically to maintain the lake close to the normal pool of 553.8. The main lake is clearing, but still a bit stained. The creeks and coves are partially clearing with the backs still stained. The surface water temperature is approximately 60 degrees.